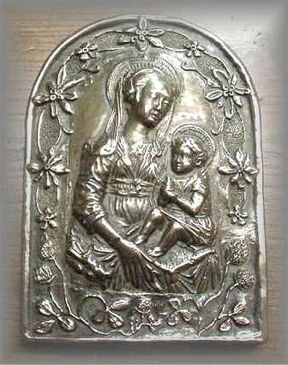 "WG.13.f - MADONNA & CHILD (Large) Floral Frame (7 in. H x 4.875 in. W) "
MADONNA AND CHILD (Large) Floral Frame: When the Archangel Gabriel was sent to Mary, the whole of creation was posed waiting on her response. Supposing she said, 'No'? What would happen? Her acceptance was pivotal, 'The Second Eve'. A term used since the 3rd century. WILD GOOSE QUOTE: 'Lady of Silences, calm and distressed, torn and most whole, rose of memory, rose of forgetfulness, exhausted and life giving, worried reposeful. This is based on a Renaissance carving.